Album release show at the Grey Eagle! February 12th, $8 gets you into the release show, andddddd a physical copy of the album with each ticket price! The album will be performed in its entirety as well as my dear friend Billy Litz opening, and many other guest appearances! Do Not Miss this!! Check out my interview and live performances on the WNC Original Music Podcast, I also preview some songs of off my upcoming record! Wow... its been 4 years. Got some studio time booked, New full length album in the works, New cornbread recipes to come. I was chosen as a Brown Bag finalist, and will be competing against some very talented people on Nov. 23rd. at Asheville Music Hall. Don't Miss it! 2/17/14: Show at Foobar in East Nashville Wed. Feb 19th, with my buddies Charlie Whitten and Derik Hulquist! Starts at 9:00pm. make sure to check out the Facebook event too. 2/12/14: Heading back to Johnson City to play at one of my favorite venues, The Down Home. I'll be playing alongside my buddies Crazy Water Crystals, playing some of the best brother duet style music I've heard in awhile! check em out and see you in Johnson City! 01/15/2014: New Shows just added! February 1st at the Listening room, as part of a benefit for alive hospice! 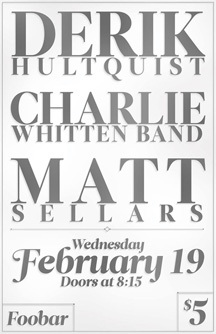 As well as February 19th at the Foobar in East Nashville, along with my good buddy Charlie Whitten! 09-01-13: Last minute show just added! I'll be joining my good buddy Will Hastings at Drifters in Nashville on Wednesday September 4th! Be sure to come out and get serenaded while you stuff your face with BBQ! 08-27-2013: American Songwriter featured me on the website as the Daily Discovery! Love those Guys! Check it out here. Don't take my answers too seriously. 08-19-2013:Featured on Lightning 100 radio show 08/19/2013, 'The 615'. Listen 18 minutes into the show and hear ME! 08-20-2013: First Cornbread session! My take on the Jimmie Rodgers classic, Peach Picking Time in Georgia. ( http://youtu.be/Bih-P99Y7lU) Be sure to take a gander at mah papaws ol spicy carolina cornbread recipe in the recipe section too!